“A Wifi-enabled countertop device that prints beautiful high-resolution images and messages directly onto any foam-topped drink is providing operators with a completely new way to interact and engage with customers. Hilton London Tower Bridge, in the shadow of The Shard, is among the big names to have spotted its potential. FEJ headed over to find out how the equipment is giving it a point of differentiation in a competitive market. It is not uncommon for catering equipment manufacturers to insist that their products deliver an ‘experience’ for customers, but in the case of Ripples and its flagship Ripple Maker there is a strong argument that it genuinely does. Using technology that has been in development for a decade, but which has only been made into a viable commercial proposition since it received seed funding three years ago, the system can ‘print’ any image or text atop the foam layer of coffees and cocktails. The unit, which prints in a matter of seconds using a coffee-based extract ‘ink’, is beginning to catch the attention of the hospitality market, with Lavazza, Marco Polo Hotels, Shangri-La, The Four Seasons and Starwood among the early adopters. In the UK, Hilton London Tower Bridge is also using one and there’s every chance that more of the hotel chain’s sites could purchase them in the future. James Ross, director of operations at the Hilton London Tower Bridge — and previously the site’s F&B manager — has played a intrinsic role in making sure the hotel’s TwoRuba Bar and Restaurant is getting the most from its investment in a Ripple Maker. It has had the system installed for around four months and admits the equipment was brought to its attention by Hilton’s food and beverage operations director for Europe and Israel, Anthony Worrall. He was visiting one of the group’s overseas sites when he was served a cocktail with his face on. The Ripple Maker can print text and graphics on any foam-topped beverage. Although technically an item of catering equipment, the Ripple Maker sits comfortably front-of-house, taking up a footprint of just 8.5 inches by 10.5 inches. As soon as Hilton brought it into TwoRuba, Ross quickly identified the extent of its potential. Staff and customers can select from an extensive content library of images, or upload their own images or designs to the machine through an app. 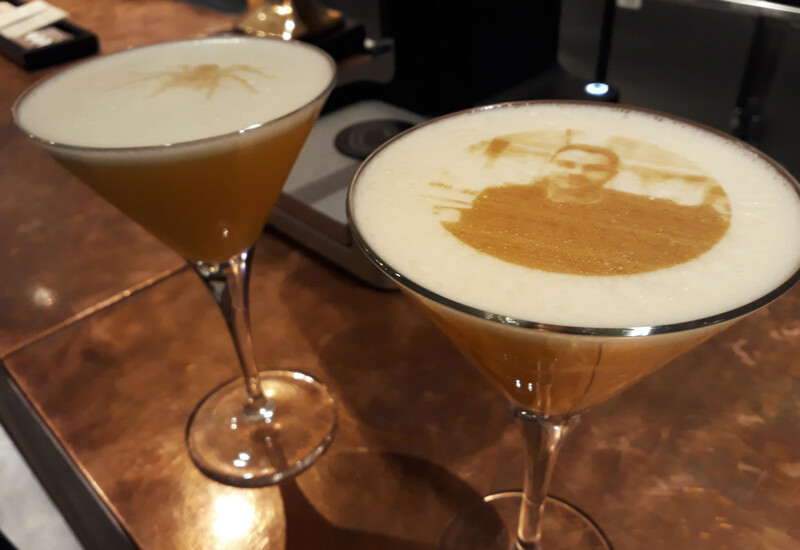 During Halloween it printed images of spiders and cobwebs on special themed cocktails, while one customer used it to deliver a marriage proposal. As more people download the app, Hilton expects demand for personalised prints to rocket. The Ripple Maker prints using a completely natural, additive-free coffee extract. What about from a profitability point of view — will a piece of equipment like this help TwoRuba to increase its margins on cocktails? Ross replies: “I think there is opportunity to exploit that. We have really gone down the social media route — making it a talking point and something for the bar to be synonymous with. I suppose you could put a premium on the cocktail, although I don’t think we will, it is more of a driver. Where we have done autumn cocktails and Christmas cocktails, we have not charged anymore because it has got a print on it, though we might sell more because it is on there. 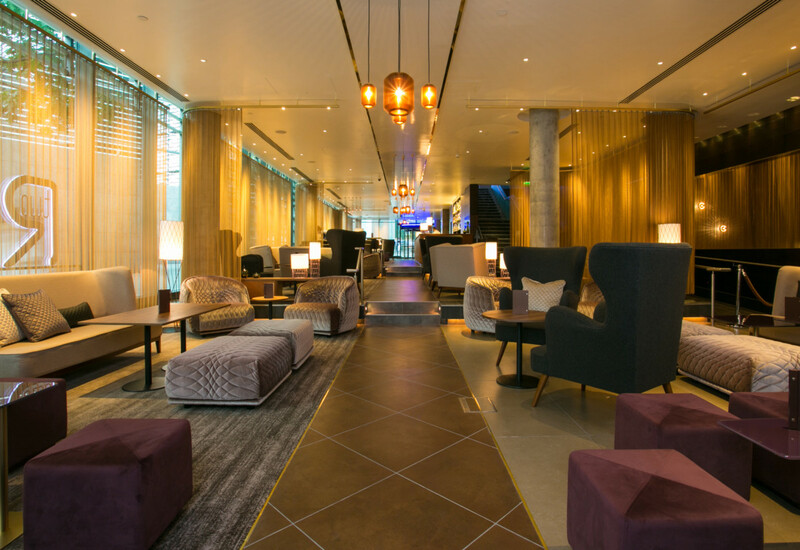 TwoRuba is one of Hilton’s ‘destination’ bars, which are typically high-end, independently branded bars that sit under the group’s umbrella but are ultimately afforded greater autonomy. How does that play out when it comes to food equipment specification — a group like Hilton must enforce some rigorous guidelines? “There are two aspects to that question. You’re right, when you have a big brand, getting in new equipment and doing new things has to comply with a very stringent brand standard criteria. However, destination bars fall outside of that and that is why we have our own menus, independency with various things we can do, and we are not measured on the same brand standards and criteria. 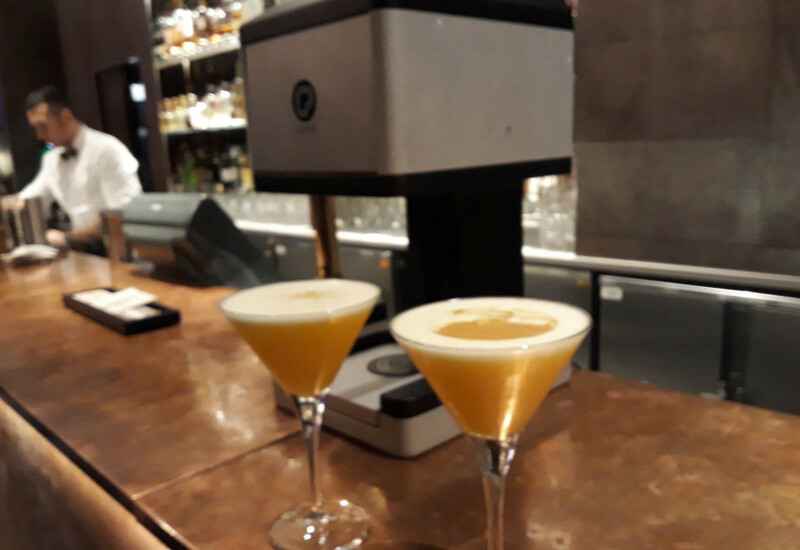 TwoRuba Bar and Restaurant at the Hilton London Tower Bridge has boosted customer engagement by installing a Ripple Maker. Ross is not in a position to comment on whether the Ripple Maker will be rolled out across other Hilton venues, although he reveals there is a growing awareness of the technology within the business. What is the Ripple Maker? The Ripple Maker is a Wifi-enabled countertop device that prints images on top of a variety of foam-topped drinks, including coffees and cocktails. The Ripple Maker is made by Steam CC, a privately held, venture-backed company. The device is manufactured by a Dutch company in a state-of-the-art manufacturing facility in China. How does the Ripple Maker work? It works by combining patented 3D printer mechanics with Inkjet printing technologies. The beverage is placed on a self-rising tray and then the image or text is selected from the screen on the machine. It takes just a few seconds to select and print each design. Do staff need much training to use the machine? No, the manufacturer claims the Ripple Maker can be mastered in minutes. There is no need to set aside time for lengthy training sessions. But perfect foam with minimal or micro-bubbles is key. What does the Ripple Maker print with? The ‘ink’ is coffee extract, dispensed from a ‘Ripple Pod’. A single Ripple Pod will create approximately 500 prints. Ripple Pods are included with customer subscriptions and are re-supplied as per individual customer requirements. How do you get more Ripple Pods when they run out? Ripple Pods aren’t sold individually, they’re included as part of an operator’s subscription. Ripples tracks the machine’s status and will automatically ship new Ripple Pods before they are needed. Will the Ripple Maker change the taste of a customer’s drink? Because each print is created from a minuscule amount of coffee extract, there is no effect on the quality or flavour of the beverage being enjoyed. The manufacturer claims the added caffeine content within each print is ‘negligible’. How regularly do Ripple Makers need servicing and who does it? Ripple Makers do not require regularly scheduled maintenance. Operators just need to wipe down the drip tray at the end of each day. All machines are backed by a one-year warranty. How quickly can an operator expect to see a return on investment from its Ripple Maker? Customers that charge their customers for adding Ripples to their drink report full ROI in only three to five months, according to the company. Customers who utilise Ripples as part of their customer experience programme say that for the minimal cost that the Ripples platform entails, it represents the highest ROI of their programme. How much does the Ripple Maker cost? Ripples recommends the selling price as €2,000 (approx £1,850) and a 12-month subscription for the Ripple Pods starts at €1,200 (approx. £1,140). Each Ripples customer has their own account, which allows them to manage their subscription and orders. The Ripple Maker’s on-board computer monitors ink levels and will automatically send a notification to Ripples when it is time to dispatch a new Ripple Pod to the customer, which minimises the need to store Ripple Pods as well as wastage.